This article is about Erin's Husband. For other uses, see Brian. 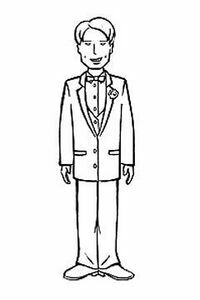 Brian makes his only appearance on-screen during the episode I Don't, which deals of his marriage to Erin. He spends most of the time making chauvanist remarks, either as jokes (to the annoyance of Daria Morgendorffer) or in a futile attempt to diffuse a tense situation. He eventually flees his own wedding reception to escape his in-laws fighting, and when found in a bar he refuses to go back. He once worked in government intelligence, according to himself and Erin. He did not have his job long, however - possibly because Erin liked telling everyone what Brian did for a living - and was fired after his honeymoon. Brian, after a brief session with the full Barksdale/Morgendorffer family. At some point, before (or possibly during) his relationship with Erin, he contracted herpes from an unknown partner. In Season 5, his marriage was breaking down and it came out he was living off Erin's salary while studying for a real estate exam. Erin actually wants a divorce in "Aunt Nauseum", hiring her aunt Helen to start the proceedings while revealing that he'd gotten her to sign a pre-nuptial that'd give him 50% of her assets if there was a divorce and that they'd only gotten married because he'd given her herpes and she felt nobody else would want her. However, during the episode, Brian is able to talk her out of it after flying to Switzerland and they had a second honeymoon there (It is often assumed by fans that Grandma Barksdale paid to send him there, to keep the couple together). Brian's last name was not revealed with precision in the show. 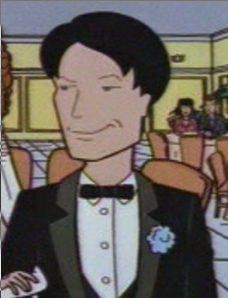 It appears, from the way Daria referred to the wedding in "I Don't", that his surname is Danielson, as the bride's name almost always comes first in wedding announcements by convention. In some fanfics, Brian is known as Brian Chambers. Rita Barksdale really hates him. Fanfiction is often unkind to this character, with Brian being treated either as an incompetent leech and drunkard (e.g. Falling Into College) or as an outright criminal (e.g. Invisible Planet). In the slasher spoof Daria 2: The Curse of the Misery Chick by Aaron Solomon (ben Saul Joseph) Adelman and Barry Eshkol Adelman, he's investigating murders with Agent Fleming. In the fanfic It's All About Respect, the alternate-universe version of Brian is Alfred Brian Chambers IV; during the course of the fic, he is severely injured and mind-wiped by Colonel Franklin Davers, who was under orders to kill Brian for hhis traitorous actions (as a former member of the government group known as the Domestic Operations Agency. However, Franklin determined that the mindwipe and is injuries would render Brian unable to cause any more harm. In the John Lane series, Brian appears in alternate versions of "I Don't" and "Aunt Nauseum". In the latter, unlike in canon, Erin turns up in Lawndale and a drunken Brian pursues, leading to him getting flattened by John Lane and Jake. In the God Save The Esteem series, Brian and Erin move in with the Morgendorffers; as he's clearly not studying for his real estate exam, Daria forces him to do so. In "For Better or For Worse, For Richer or For Poorer" by Kristen Bealer, we see Erin's POV of "Aunt Nauseum", as well as how the two got together (in which it's clear he lied about working in "intelligence" and married her for money). This page was last edited on 27 May 2018, at 15:28.